or fester like a sore, and then run? or does it just explode? and riots in Ferguson started with the shooting of an unarmed black man by a white police officer. There are many stories as to what happened, little is clear about what transpired. What is clear is that an unarmed black man was killed by a white police officer and then left there in the street, dead, for four hours, as though his life had no worth. His community walked past this body, left there to rot, to stink like rotten meat, a visual example of a dream deferred. The argument about what Michael Brown was doing or why he got shot are pointless to a community besieged by violence and poverty, a community that has seen jobs disappear, that was displaced to build an airport that never was, a community that knows it has little value to the police force or the others in the city. 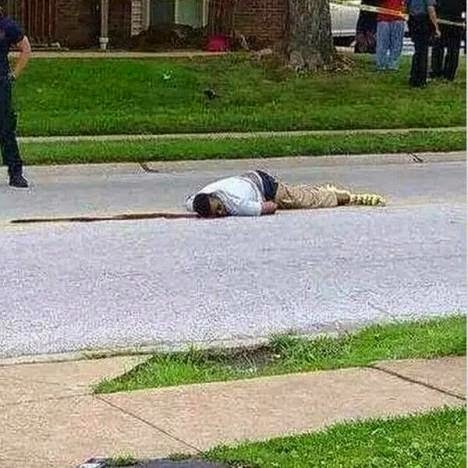 Michael Brown was a human being, a human being left to rot in the street for hours. His death and the actions following are a visceral example of how the black people of Ferguson, and the United States, are valued by the rest of society. It is so easy to say that this is Missouri. But we know this is not true. We know that our police department has its own issues. We know that our neighborhoods have their own issues, that in spite of our thinking of Seattle as an egalitarian place, we are still pretty darn segregated. A friend of mine has had the n word shouted at him numerous times, not too long ago while walking on Queen Anne. We read in the news about a white man going ballistic and screaming racial epithets at protesters at Westlake center, spitting on a black man, the men trading insults and the black man getting pepper sprayed in the face. White guy going nuts, black man gets pepper sprayed. Those of us who are active on social media and are paying attention to what is happening in Ferguson have seem the numbers, we have taken in so much news about racial disparities in this country, about the worth of life of black people in the United States. We watched Melissa Harris Perry do a short piece on the fact that from 2006-2012 a black man has been killed by a white police officer on an average of twice a week. Twice. A. Week. All over the country. We read about the incredible disparities in our judicial system, where people of color are appalling. 1 of every 15 black men and 1 of every 37 Hispanic men are in prison, compared to 1 in every 106 white men. There are those who would say that this is cultural, even genetic. That people of color are genetically disposed to crime, or that their socio economic background leads them to lives of crime. However, when we look at statistics, this does not bear out. In the war on drugs, blacks have been disproportionately jailed and punished. While African-Americans make up 14% of regular drug users, they make up 37% of those arrested for drugs. African-Americans receive sentences that are 10% longer than whites and are 21 percent more likely to receive mandatory-minimum sentences than white defendants and are 20 percent more like to be sentenced to prison. (source). There are the horrible polling numbers on how different races are viewing the events in Ferguson, the fact that people are more likely to vote for the death penalty if the person is black. I could stand here all day and quote depressing statistics on the state of race in this country. You get the picture. Something is wrong. But what can we do? I’ll tell you what we can’t afford to do. We can’t get paralyzed. We can’t ignore this if we want any semblance of a just society. If we want this kind of violence and injustice to stop, if we want to put an end to explosions caused by dreams deferred, we must act. We must not conform to our society’s rhythm of spending a few weeks a year thinking about race and then ignoring it until another explosion. We are called not to conform, but to be transformed. Before transformation, though, there must be confession. I have been active in one way or another in anti-racism work since the 8th grade. I have given speeches, written blog posts, given sermons, taught classes on privilege and race. I have had black friends. I have traveled. I have read. I have studied racism and prejudice. I confess to you today that I am still racist. I don’t want to be. Most people don’t want to be racist. That’s why we deny it so fervently. It is a horrible thing to judge someone by the color of his or her skin. It removes the humanity from a brother or sister in Christ and turns him or her into an object, a mass of skin, something not even worth an ambulance or 911 call. Something that can be left in the streets to decay and stink like rotten meat. While I was studying the works of Dr. King and Malcolm X, while my parents were working hard to get me to events in Cleveland that would allow me to at least be around people of color, I was growing up in the 4th least diverse city in the nation. I was growing up in a town that had probably 10 people of color, 4 of whom where in my high school. I grew up around people who used the n word as an adverb – it would go before words like rig, knock and lip. People from my high school once joked about wearing white sheets to a basketball game to scare the referee. While I did react strongly to the white sheet “joke” there were so many things around me that were racist that I didn’t even notice. That’s the worst kind, the kind of racism that is so subtle you can’t call it out. That’s the stuff that gets into your bones. It was not easy to see my own racism. After all, I am a good progressive, I do the work, I had a shirt in 8th grade that said Love See No Color. I had black friends! That’s always the thing, right? I’m not racist, I have black friends!! How could I be racist? And, every now and again, I still do. In spite of myself I have conformed to the world around me. I am in need of transformation. Each and every day. Admitting we have a problem is the first step to recovery. And we have a problem. We don’t like to look into it because we don’t like ugly truths about ourselves. We don’t want to admit that we judge others based on their appearance. It’s so… unprogressive. But the transformation process is never pretty and never comfortable. Transformation is painful. And before we can transform the way our nation behaves about race, before we can really change the inequality in our schools, in our judicial system and in our government, before we can fight the systemic racism that sends people of color to jail more often and longer than their white counterparts, before we can put an end to the school to prison pipeline, we have to look in our hearts and admit to ourselves that we have racism in our hearts. That every now and then we clutch our purse tighter or cross the street when people of color are around, that we occasionally think stupid stuff regarding a person based on their color. We have to admit it and then we have to try to change. This is transformation. This is not conforming. If we want to put an end to the violence, if we want to work to never see an unarmed black person die at the hands of a white person, if we want to put an end to these flare ups in racial tension like we have seen these past weeks in Ferguson, and before that in Florida, and before that in Oakland, Toledo, Cincinnati, St. Petersburg, Harlem, LA, Miami… (These are the moments of racial violence I found on Wikipedia since 1990)… if we want to put an end to the violence, we have got to look at how we contribute to and benefit from the problem. We have to dismantle the racism in our own hearts before we can dismantle the system. I mean, we don’t have to. We can do what we have been doing. We can get really upset at these images we see on tv, we can protest and post about it on Facebook until we get bored with it or it gets too hard or we get tired of thinking about race all of the time and then forget that it is a problem until the next time it blows up somewhere in our nation. Maybe next time it won’t be in Ohio or Missouri. Maybe next time it will be at 23rd and Cherry. But when we do this, when we go on pretending that we don’t have a problem we are injuring the body of Christ. The leg is being bludgeoned on a regular basis and we just keep limping along. Occasionally we bandage it or we put on some shin guards, but we do little else. It is too hard, to painful, too much. It is exhausting. Why do we have to talk about race all the time? This is one example of our privilege. One of many. As a white person, I rarely have to think about my race. From what I hear and read from people of color, this is a luxury they do not have. This is a luxury we should give up, part of our being living sacrifices to the lord. Give up the comfort afforded by ignoring issues of race. Transform through the renewing of our minds. Learn about racism. Learn about white privilege, break down barriers. There are organizations within the church and in Seattle that work to educate white people about race. Go. Learn. Be transformed by the renewing of your mind. Don’t be afraid to call yourself out on racist thoughts. And don’t be afraid to call out people in your life who do it too. Silence is permission. As much as it is easier to not say anything, as it is easier to be comfortable and quiet, we are called to more. We are called to not conform. I was taught in seminary to always end on a note of grace. You don’t want people leaving thinking everything is awful, I’m awful, this is awful. God help us to be living sacrifices, help us to be transformed nonconformists. Your will, not ours, be done.